Black Rot is the fruit rot phase of the Gummy Stem blight pathogen, Didymella bryoniae (Phoma cucurbitacaerum). It is characterized by a distinctive black decay of the fruits of all cucurbits. In temperate regions, the disease occurs mainly on winter squash, pumpkin, and greenhouse cucumber. Symptoms vary on different cucurbits. 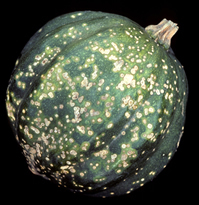 On pumpkin and winter squash, symptoms on the leaves begin as a marginal necrosis followed by larger, wedged shaped necrotic areas, often with a yellow halo. Stem cankers develop in the cortical tissue and a brown, gummy exudate is produced. 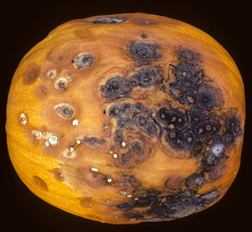 Small fruiting bodies (pycnidia or perithecia), may appear as black specks in diseased tissue. Stems may be girdled on seedlings and the plant dies, or on older plants stem cankers lead to wilt and decline. Small, water-soaked spots develop on fruit, enlarge, and exude gummy material and contain many black, fruiting bodies. D. bryoniae is both seed and soil borne. The pathogen may be carried in or on seed. In the field, the fungus can survive in infected plant residue for more than one year. The disease is favored by relative humidity over 85% and leaf wetness periods greater than one hour. The optimum temperature for disease development is 75-77° F. Leaves are penetrated directly by the fungus, stems are infected through wounds or expansion of leaf lesions, and fruit are infected through flower scars or wounds. Wounding, striped cucumber beetle injury, aphid feeding, and Powdery Mildew all predispose plants to gummy stem blight infection. Control of Powdery mildew by chemicals or genetic means can significantly reduce Black Rot in pumpkins and winter squash. Use certified disease-free seed for all cucurbit plantings. Rotate out of cucurbits for two years. Crop debris should be plowed under promptly after harvest. Control of Black fruit rot starts with control of gummy stem blight. Powdery Mildew tolerant cultivars should be selected. Control cucumber beetles and aphids. Satisfactory control can be obtained by regular application of protectant fungicides.